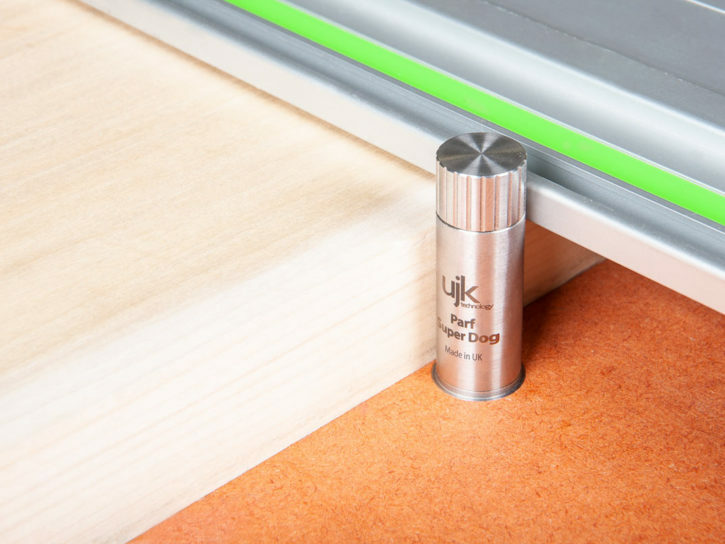 If you want to create a custom benchtop or portable cutting board in less than 30 minutes whenever the need arises, the new and improved UJK Technology Parf Mk II Guide System ticks all of the boxes. Every woodworker strives to achieve consistent right-angled cuts. Based on Pythagoras’ theorem, the UJK Technology Parf Mk II Guide System helps to produce a benchtop with an accurate pattern of 20mm holes. 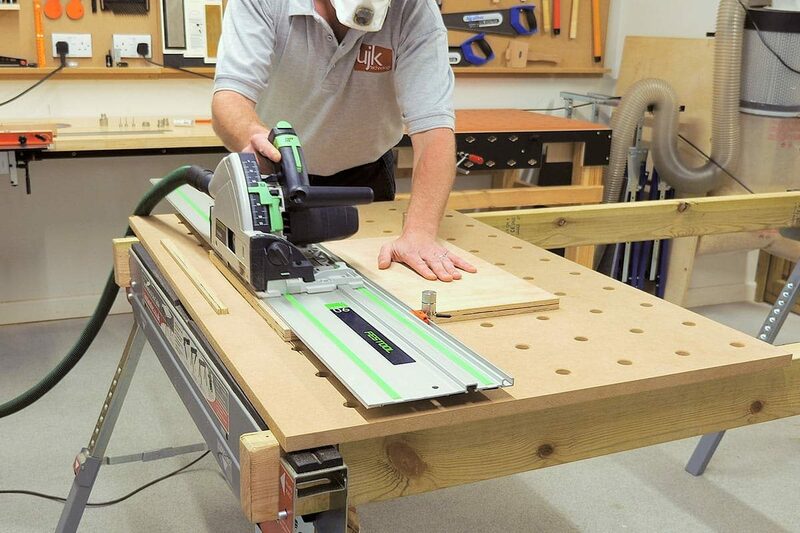 When used with a set of UJK Technology Parf Super Dogs, a guide rail and a track saw, it guarantees perfect, quick and easy 45° and 90° cuts every time. The Mk II (Mark 2) is an upgraded version of the existing Parf Guide System. 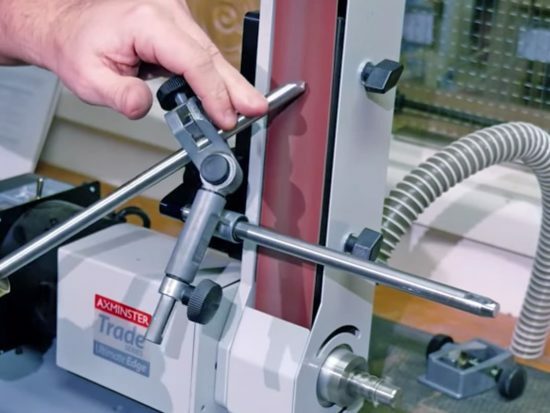 Designed by Peter Parfitt, the latest Parf Guide System is a joint venture with Axminster Tools & Machinery. 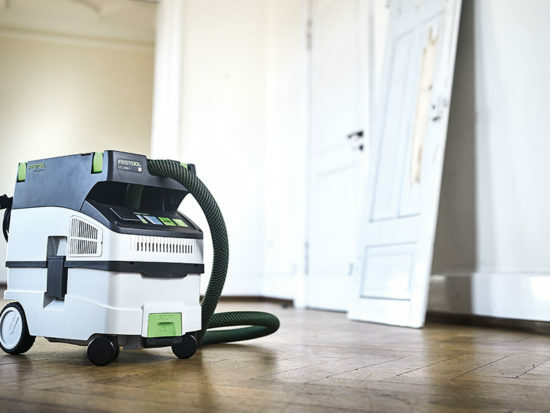 Manufacturing of the system takes place entirely in Axminster, Devon under the UJK Technology brand name. The design of the upgraded Parf Guide system preserves and guarantees the long-term accuracy of the jig as well as improving the ease of use. If you’re looking to build your own workstation or multiple workstations, the UJK Technology Parf Mk II Guide System is an invaluable tool for both professional trades and home workshops alike. 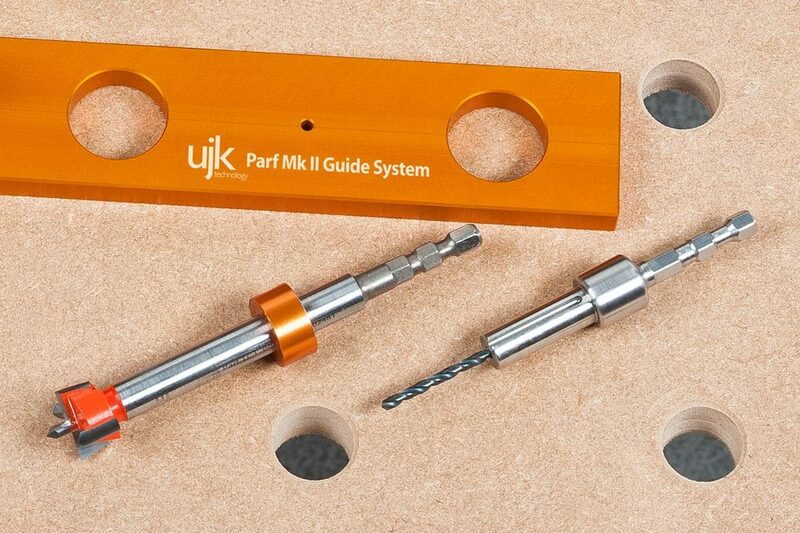 The Parf Mk II Guide System uses two Mk II Parf sticks along with a drill guide and a special 3mm drill bit to create rows and columns of holes at perfect right angles. 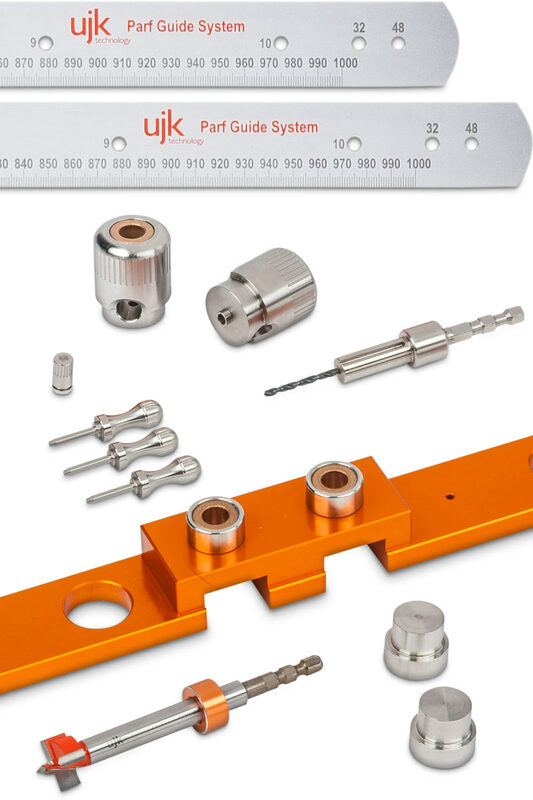 Once the pattern of 3mm holes is complete, you must use the special Parf drilling jig and 20mm boring bit supplied with the kit to enlarge the holes to 20mm. Once complete, your bench top is ready to take the Parf Super Dogs. Both drill bits are suitable for all 1/4″ hex quick change systems including the Festool CENTROTEC. Two Parf sticks; 2 x 1m long rules with a series of 6mm holes along the length at 96mm centres. Two drill guides used to guide the 3mm drill bit. A quality 3mm drill bit and holder to be used with drill guide and guide block. 3 x 3mm guide pins used to keep your Parf sticks in place when marking out. A CNC manufactured guide block; this works in complete harmony with all parts of the system. The hole for the 20mm drill bit is fitted with a bronze self lubricating bushing to give the minimum amount of play. Two low profile dogs; these replace the 3mm locating pins for the second round of drilling. Once your table is complete, the locating dogs make very useful accessories. The shaft of the 20mm bit is ground to a very high tolerance to work perfectly with the bronze self lubricating bushings in the guide. The centre point of the drill is designed for guaranteed accuracy. It has a 3mm diameter that accurately finds it way into the 3mm holes. You may ask, what’s the difference between the current Parf Guide System and the latest Mk II version? Here we give a few of the added benefits of the latest Parf Guide System. First and foremost, the Parf Mk II Guide System is the ultimate when it comes to the 5 cut test. It is called a 5 cut test because you cut the first surface twice. Secondly, the upgraded version delivers better engineering practice. Since the launch of the original Parf Guide System, we have been working hard to develop the existing concept and add several user-friendly benefits. As a joint venture with Peter Parfitt, we’ve made the UJK Technology Parf Guide System into something even more effective, offering you more control. Previously, (through bad practice) it was possible to elongate the 3mm holes in the ruler over time when using the simple guide bush. However, we’ve now found a way to completely eliminate this issue. 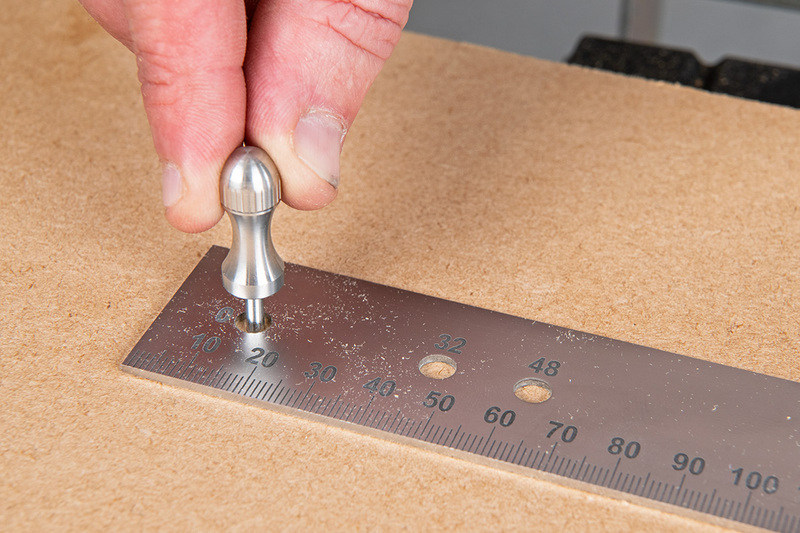 With the Parf Mk II Guide System, the drill bit never comes into contact with the ruler thanks to the larger 6mm holes. This means neither the drill bit nor the ruler will ever wear out. Next, rather than just the 1 drill guide, we’ve now included 2 x Mk II drill guides. Throughout the majority of the process, you’ll use the 1.5mm deep drill guide. However, when the two Parf sticks overlap, you will need to use the 3mm deep drill guide to accommodate the extra depth. Furthermore, the 3mm drill bit is now supplied in a Festool CENTROTEC holder for quicker, more efficient working at all times. Also, the Parf sticks are now more robust, thanks to the pearl chrome finish. Lastly, there’s no glare or reflection which makes them easier to work with in bright and well-lit areas. As before, there’s a metric scale on both of the rules, but it’s much clearer this time. The rulers are precise thanks to the high quality manufacturing methods and make useful metre long rulers. Moreover, the holes on the 1m rules are now numbered. This makes it easier to reference and reduces the chance of making any errors. We’ve also added in extra holes along both of the Parf sticks. This means it is possible to now make a grid 48mm or 32mm apart in addition to the standard 96mm. If you need to make smaller components, the smaller spacing is ideal for creating a tighter formation. The new and improved UJK Technology Parf Mk II Guide System is efficient, simple to use and reliable. It is ideal for home workshop and professional trade use. 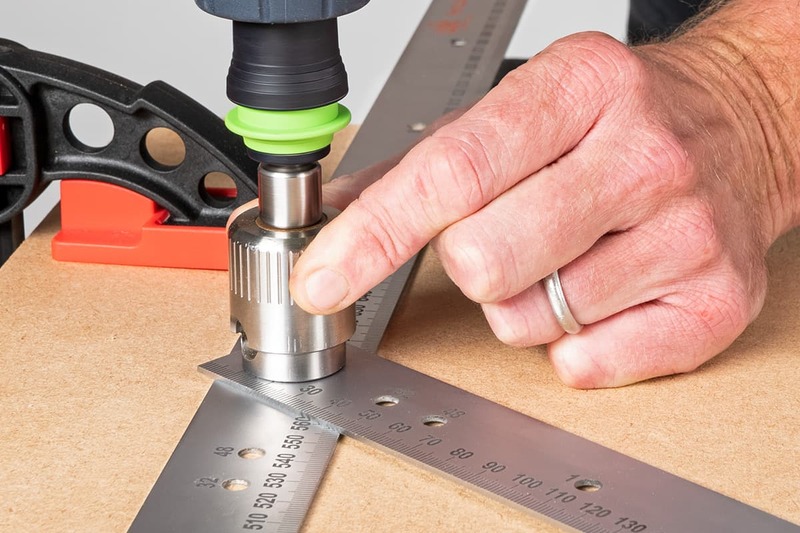 If you’re looking to create multiple custom-made benchtops or portable cutting boards in under 30 minutes, this is the tool for you. The Parf Mk II Guide System guarantees perfect 45° and 90° cuts, producing highly accurate results every time and eliminates any potential issues through best engineering practices. If you’ve enjoyed reading this article, we have plenty more which might be of interest to you. Firstly, The Story of the Parf Super Dog takes a look at how our first dog came to life. 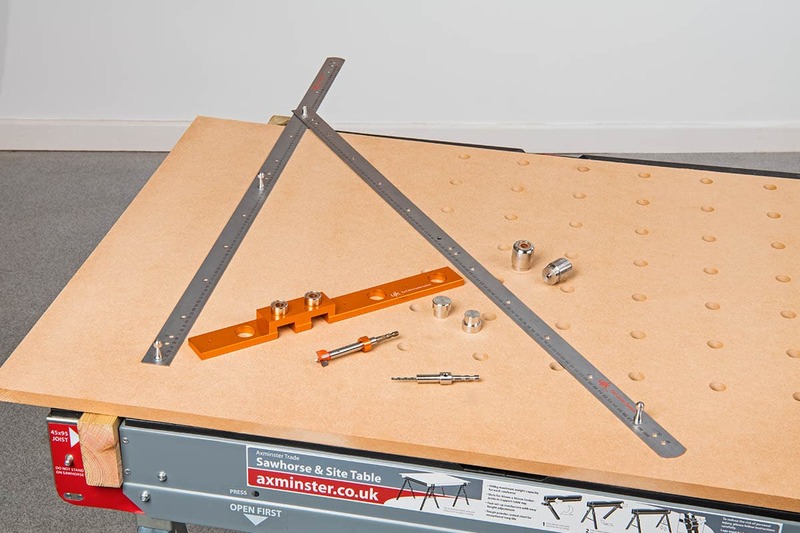 Since 1981, Axminster has proudly developed and manufactured a wide range of tools on-site here in Devon. 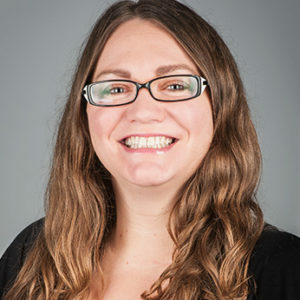 Alongside ensuring high standards, developing in-house empowers us to listen to our customers and provide effective innovation and product development. 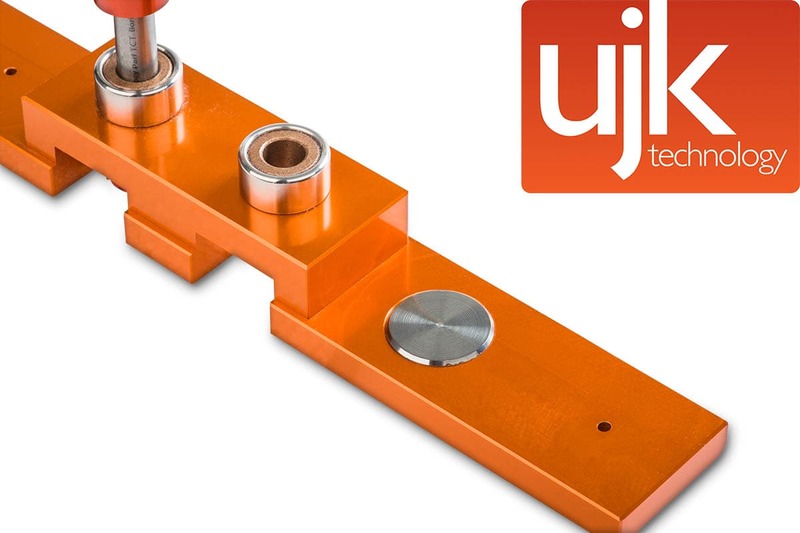 Next, if you are looking for high quality, innovative woodworking products, why not take a look at the entire UJK Technology range? As a unique Axminster brand, its creators have over 200 years of woodworking experience between them. What’s more, many UJK Technology products are designed, developed and manufactured in-house here in Axminster, Devon. 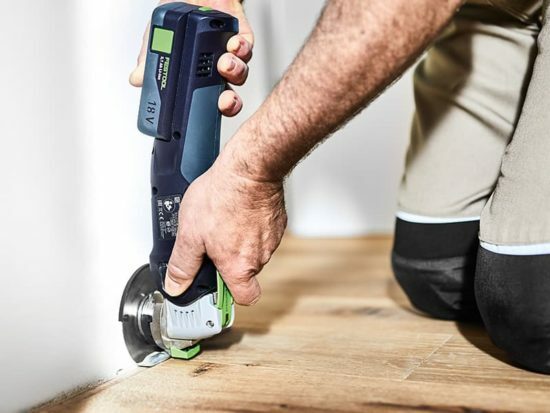 For convenience, the range encompasses routing, measuring, jig making and wood jointing products to make joinery fast, clean and easy. If you’ve bought the new and improved UJK Technology Parf Mk II Guide System, we’d love to hear from you. Comment below or send us a photograph and tell us all about your new purchase. What do you love about it, and why? Alternatively, get in touch via our social media platforms. Find us on Facebook, Instagram or send us a tweet using #parfguidesystem to @AxminsterTools. Hi, what’s the shaft diameter and length? I’m planning to use the dril bit for something else and can’t find the info on the website. Thanks. I’ve spoken to our Senior Innovation & Product Manager who confirms that the total shank length is 105mm. The cutter has a 6.35mm Hex shank machined into the top for use with a small drill. If you intend to use this cutter in a router (not recommended), you will need to remove this. The remaining shank is 10mm in diameter and 66mm long.